Timothy L. McInerney represents general contractors, subcontractors, owners, sureties and design professionals in all aspects and sizes of construction claims and transaction matters. Engineering-in-Training Certificate from the State of California. 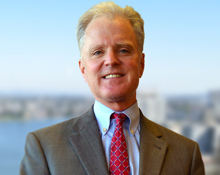 Mr. McInerney has over 30 years experience resolving legal issues on projects involving hospitals, prisons, commercial buildings, schools, bridges and geothermal plants. He also has extensive business experience in analyzing and drafting construction contracts. He has represented clients in disputes involving bid protests, OSHA violations and licensing matters. He also represents various business entities and individuals in real estate disputes and general business litigation matters. He has successfully tried numerous cases before state courts, federal courts and the Board of Contract Appeals. He has also arbitrated and mediated matters on behalf of his clients and as a neutral. He has argued over 15 cases before the California Courts of Appeal. Timothy McInerney has been selected as a Northern California Super Lawyer from 2014 – 2017. Chambers USA 2012 and 2013-Construction. Mr. McInerney has taught the Fundamentals Construction Law for U.C. Berkeley Extension since 1998.